It’s currently a white-out on the homestead, as the first big storm of winter is blanketing the place in powder. 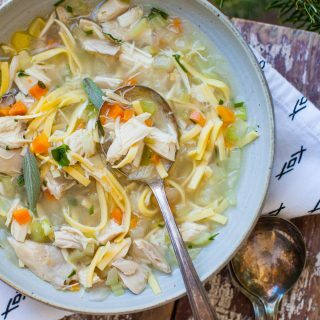 I’m thrilled at the prospect of a white Christmas – and even happier that I have a stash of homemade chicken soup in the freezer for snowed-in suppers like tonight. I always make an enormous batch of this simple soup before the holidays as it seems like a necessary antidote to all the rich food and sweets to come. I also simmer it in hopes that it will help us combat the seasonal maladies that are always going around. This nourishing soup is such a well-rounded family meal, and that certainly aids my intentions to eat better this month. 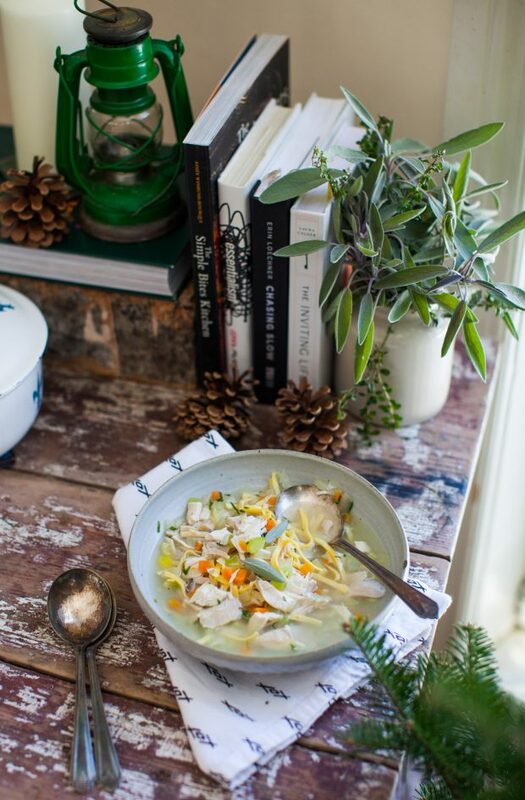 In addition, is there anything more comforting than a bowl of chicken noodle soup? Mine uses fennel alongside celery for a fragrant mirepoix and occasionally has a grating of ginger in the broth (and/or turmeric) to help fight colds. I think this soup is special, it’s certainly practical, and today I’m sharing my method for making a nice big batch. We didn’t have a classic chicken soup in our repertoire when I was growing up, instead it was mostly borscht, chowders, hearty minestrone and lentil soups. I’ve developed this recipe over my parenting years; it always seemed like the best cure-all for sick kids – and no one ever turned down a bowl. 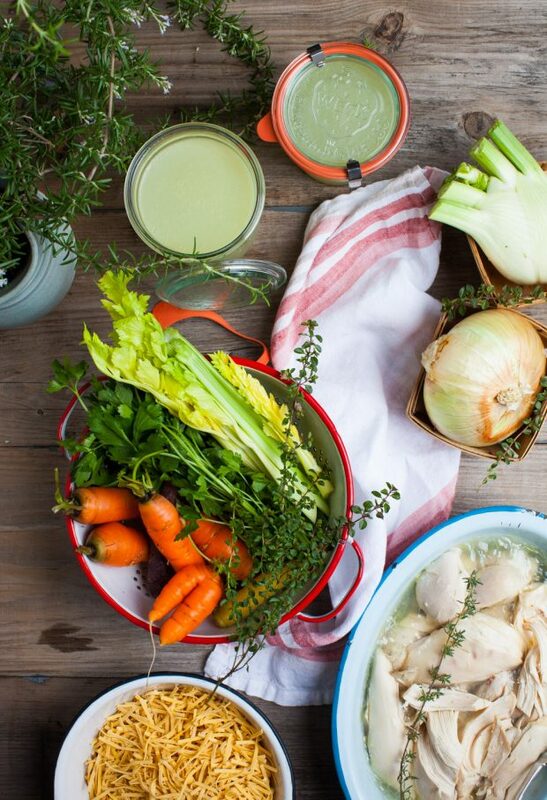 Everything starts with a whole (raw) chicken and a few aromatics in a big pot. The chicken is simmered slowly and then cooled in the broth, which makes for very tender, flavourful meat and a clear, fragrant stock. That’s the first step, and I often to it a day or two in advance. Above are the ingredients gathered for the second step: making the soup. 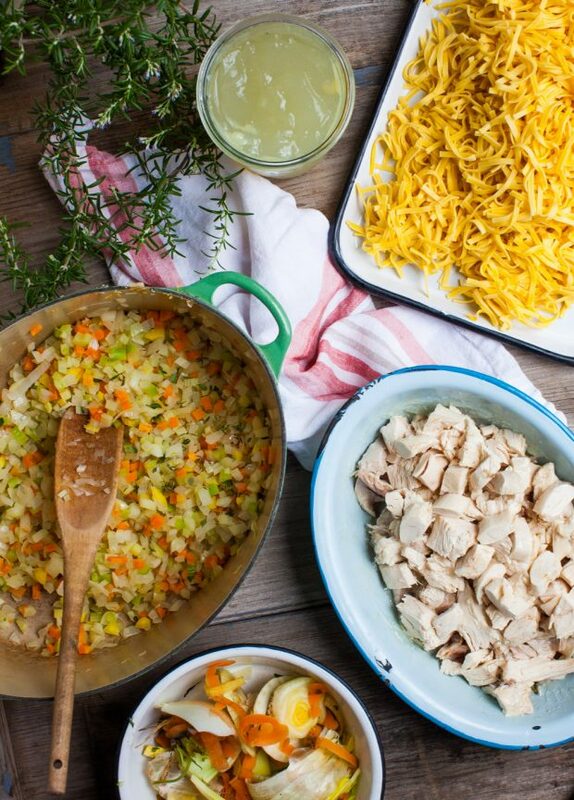 I’ve got the cooked chicken and broth, carrot, celery, onion and fennel for the mirepoix or vegetable base, a few fresh herbs and dried egg noodles. You can use any type of noodle you like (alphabet, mini shells, etc). My vegetable base gets cooked off in a bit of olive oil to sweat the vegetables and release their flavours. Then I tip in the broth, simmer just until they are tender, and then add the chopped chicken. That’s all there is to it, except for adding the noodles just before serving. The noodles are cooked separately, in boiling water, just like regular pasta, then cooled and reserved. I only cook off the noodles if we’re eating the soup right away since I don’t freeze the noodles in the soup. If I do they tend to get mushy, and they absorb all the broth. Quick tip: all the vegetable chopping takes quite a bit of time, but most grocery stores nowadays sell a raw, pre-chopped mirepoix (carrot, onion, celery) and you could definitely take advantage of that shortcut. So if I am freezing the soup, it looks like this: the broth, the veg and the chicken, a few herbs, and plenty of seasoning. No noodles. I freeze in widemouth jars when the soup is completely cooled, and I leave about a half an inch of space at the top. 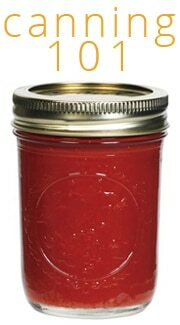 I freeze the jars with the lids off and once the soup is solid, I add the lids and label with the date. To reheat the soup, I remove a jar from the freezer a day in advance and thaw it in the fridge. I boil off of the noodles, drain them, and then return them to the pot along with the soup. Once everything is heated through, lunch is ready. 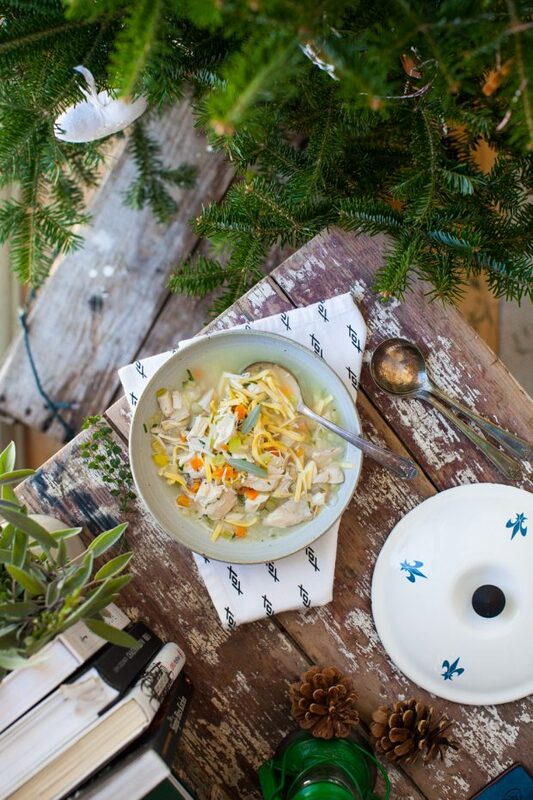 We had back-to-back holiday parties last weekend, and fun was had by all, but I had to balance out the sweets with big bowls of chicken noodle soup come Monday. I sent a jar to a friend who is sick and then I stocked my freezer with the rest. It’s mighty convenient to have around. 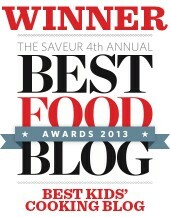 I know many of you are in baking mode (and we are too!) but I encourage you to switch gears and simmer big batch of chicken noodle soup as part of your holiday preparations. Our most comforting soup. If you can, use an organic chicken, as they tend to be much leaner than the commercial ones. If not, skim off the excess fat from the pot as the chicken simmers. For the broth in Step 1, feel free to jazz it up with lemongrass, ginger, turmeric or additional garlic. Step 1: Place the raw chicken, breast side down, in a large stock pot. Add in the bay leaf, peppercorn and garlic. Roughly chop 3 of the carrots and 3 of the celery ribs and add them to the pot, along with 1/2 teaspoon salt and 2 stems of each thyme and parsley. Cover everything with cool water, partially cover and bring the pot to a simmer over high heat. Simmer the chicken, partially covered, for 45 minutes over med-low heat. Using a sturdy pair of tongs, flip the chicken to breast side up. Simmer for another 45 minutes. Turn off the pot and let the chicken cool in the broth. When lukewarm, scoop out the chicken and shred the meat of the bones. Strain the broth into jars and discard the carcass (or use for another boiling of stock - See Note.) You will have approximately 5 cups cooked chicken and 2.5 quarts chicken stock. 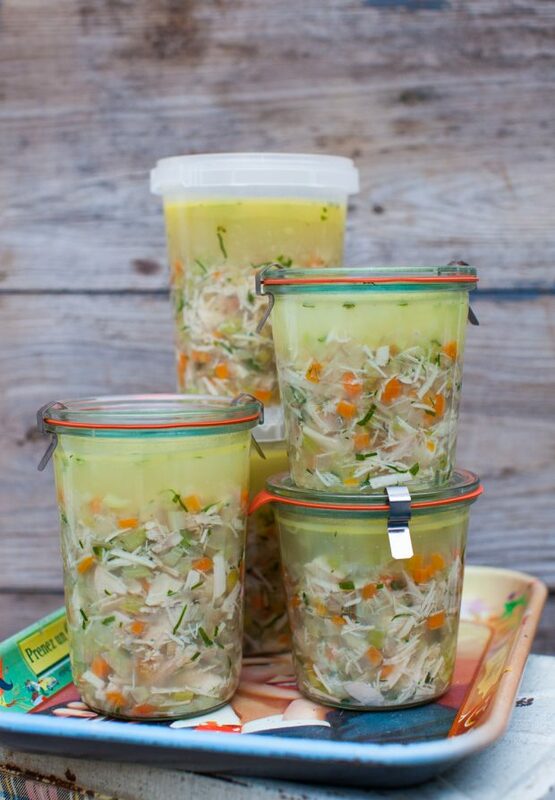 Store the shredded chicken and the stock in airtight container in the refrigerator until you are ready to make your soup, up to three days. Step 2: Dice the remaining carrots and celery, along with the fennel. Heat the olive oil in a large pot and add the diced onion. Cook over medium heat, stirring occasionally, for 5 minutes, then add the diced carrot, celery and fennel. Season with the remaining salt and cook for 5 minutes. Pour in the reserved chicken stock and bring the soup to a simmer. Meanwhile, finely chop the leaves from the thyme and parsley and add them to the pot. Simmer the soup for about 10 minutes, tasting occasionally to gauge how the vegetables are cooking. When the vegetables are tender (but before they are mushy) tip all of the cooked chicken into the pot. If you are freezing the soup, turn it off now and cool completely. To serve, bring the soup up to a simmer again and hold over low heat while you cook the pasta. Bring a large pot of salted water to a boil and cook the egg noodles according to the package directions. Drain well, then distribute into bowls. Ladle the hot soup over the top and serve at once. Season as desired with additional salt and freshly cracked black pepper. After I shred the meat off, I always boil my chicken bones a second time. I barely cover them with water, add aromatics if I have any around, and simmer the stock for 4-5 hours. Surprisingly it yields another batch of stock, slightly less fragrant, but still lovely all the same. I keep it on hand for risotto and other soups. Nothing beats a pot of chicken soup simmering on the stove. It brings a feeling of warmth and comfort. It’s such a great idea to have a batch on hand during this busy, indulgent time of year. 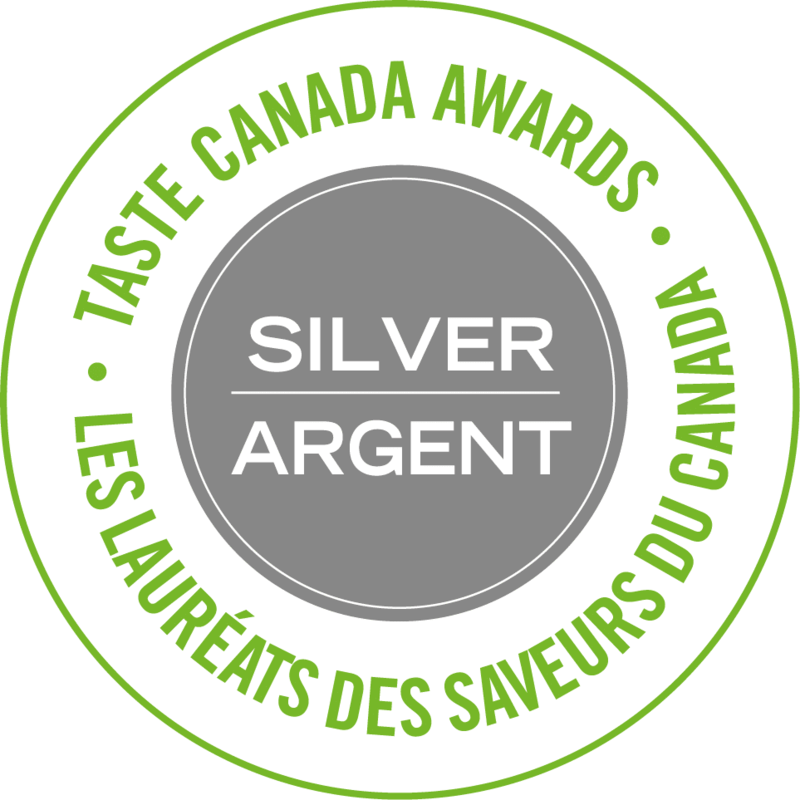 The holidays is such a good time to batch up recipes – you never know when someone will drop by and stay for supper. hey girl- this soup looks amazing! Y’all enjoy the snow! Hopefully we will get some this year here in Oklahoma! That sounds like a great plan. So excited for you! Beautiful photos! Is there a flavor advantage to sautéing the vegetables instead of adding them raw to the hot broth? I generally do the latter but wonder if I’ve been doing it all wrong for years. P.S. 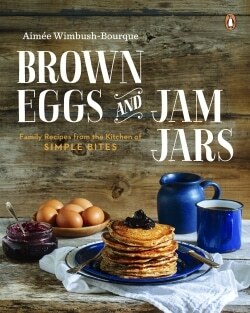 Your second cookbook and Weck jars are on my Christmas and birthday list. Fingers crossed! Yes, sweating them first really helps to break down their cell walls and release flavour! It’s okay to brown them a little bit as well as that only builds more flavour. As a vegerarian, I would really really love a vegetarian version of this, if possible! Thanks for your comment and request. Hmm, this soup wouldn’t be much without the chicken, but maybe I could develop a hearty vegetable and lentil soup that would hit all the same comfort notes. How does that sound? 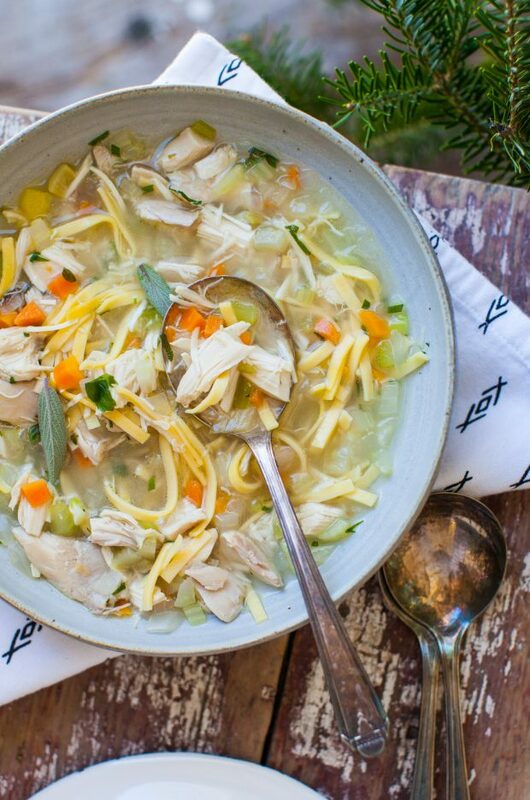 What a deliciously-looking chicken noodle soup! I’m definitely going to follow your recipe next time I’m craving it. Thanks! You’re so kind! Thanks for stopping by, Diana. 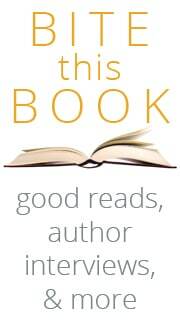 Very excited! I am going to be making this today! YUM. I am so looking forward to having this for lunch and dinners this very cold week. Thanks for posting this! Adding this to my meal plan for next week… Its been cold, and soup always makes things better! This is definitely perfect for cold weather season, Aimee! Thank you for sharing the recipe. My family loves soups so I bet they would like to try this one as well. I just wanna ask how long will it last if I make a big batch and store them in the fridge? Do you have an estimate for the number of servings or 8 ounce cups this would provide? 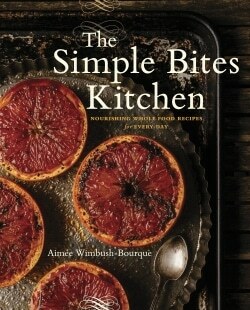 The recipe sounds great and I would love to adapt the numbers for a very large crowd. Perfect and delicious. I never would have thought to add fennel (American).